Egypt's draft constitution has 63 pages and 236 articles on everything from individual rights, religion, and the role of the state. It's hard to read, harder to understand, but it's easy to see why it's causing such a storm. And the people of Zagazig seem to take it seriously. To try to take the political pulse outside the hothouse of the capital Cairo, we drove two hours north to this dusty town in the Nile Delta. 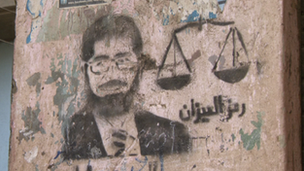 It has a catchy name and a claim to fame - it's President Mohammed Morsi's hometown. Our random survey starts in Martyrs' Square - its mini version of Cairo's Tahrir. Dark swirls of graffiti are daubed on walls flanking an unassuming roundabout. On one side stares the face of the town's first son to die in post-revolutionary violence, 19-year-old Mahmoud Suleiman, starkly painted in red and black. On the other, there are rude slogans cursing the Muslim Brotherhood which can't be printed here. When I take out my microphone and a pocket-sized copy of the draft constitution, a car immediately swerves to the side of the street. A local businessman in a grey suit and tie rolls down his window and leans over, eager to talk. "I voted for Mohammed Morsi but I will vote 'No' to this constitution. It will divide Egypt in two," warns Sharifi al-Sawah. Another local resident in a smart leather jacket joins our conversation. "It's very good," insists Mohammad Kinawi, a tour operator. "I tried to find some point where you can say it's not good, but in fact I like it so much I will vote 'Yes'." Does he support the Muslim Brotherhood? "I don't support them or any other. I support a peaceful stable life in Egypt," he asserts. As we talk, another man saunters over, leafs through the constitution, and points to one article. "He doesn't like Article 217 regarding some of the president's powers," Mr Sawah explains. An animated conversation, with a constitution passing from hand to hand, quickly turns into a magnet for passers-by. The crowd swells with dozens of people jostling to share their views - loudly and passionately. "No no no!" shouts one headscarved elderly woman, who grabs the blue booklet with the Egyptian flag splashed across its cover. "From ancient times the Egyptian people have been one, but not in this constitution!" she declares, brandishing Egypt's draft charter. Her husband in a camel tweed jacket chimes in more quietly: "Forty per cent of Egyptian people can't read or write, so how will they understand this?" Another man butts in and blurts out: "This is good for the people of Egypt!" In a growing din of dissenting voices, Mr Kinawi remarks: "Some people say yes, some say no. This is true democracy." Then he stretches out his hand to Mr Sawah with a smile and a slogan often raised during Egypt's years of revolution: "We can vote differently but we are all 'one hand'." Just down the street, there's an uglier reminder of a divided nation. Police in black uniform man black metal barricades outside the apartment building where President Morsi's family has a flat. They recently had to move out after it was targeted by angry protesters. Soldiers also keep a watchful eye. Usraya Said Ahmed: "Just because we're farmers doesn't mean we aren't educated"
When we take out our microphones there, plainclothes police immediately surround us to ask questions, and tell us we need special permission to record or film. A half-hour's drive down the road, there's nothing to set President Morsi's modest red-brick childhood home apart in the village of Al Adwa, where he was born. But his smiling face beams on many walls in a warren of winding lanes. Like most Egyptian villages, there's a single main road where donkeys, buffaloes and rickshaws jostle for space in the evening rush hour as farmers return on bullock-drawn carts from their fields. This is the Egypt where most people live, and where most are still poor. "I've read the constitution, and I'm convinced of it," asserts Usraya Said Ahmed as she tends the family's goats in her crimson cloak and a pink headscarf. "Just because we're farmers doesn't mean we aren't educated." 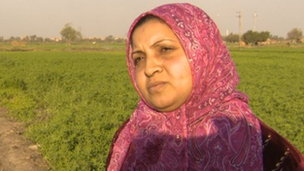 I ask her husband, Said al-Ibrahim, whether they're also supporting it to back their fellow villager, Mohammed Morsi. "I don't belong to the Muslim Brotherhood," he says. "I will be the first one at the polling station with my wife and family because the constitution gives power to poor people." If random surveys have any value, this one tells a story of a vibrant Egypt embracing its new found freedom to choose. It's also a cautionary tale to leaders not to take their people for granted as they move to define rights and responsibilities in a new nation.